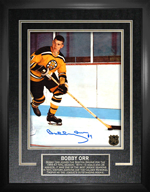 This is a framed photo of Bobby during his first season with the Bruins. He is wearing the jersey and using the stick that we are selling. This is not a Limited Edition product but will not be for sale that long. 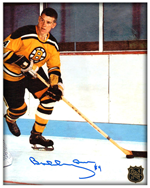 UNFRAMED photo of Bobby during his first season with the Bruins. 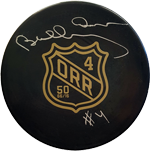 This puck was custom made for Bobby’s 50th anniversary and framed with the photo of him in 1966. Personally signed by Bobby. 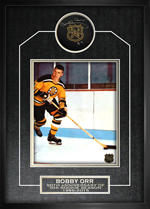 If you just want to purchase the puck unframed the price is $125. It comes with a certificate of authenticity and numbered hologram. Shipping and handling included.